The underlying forces moving the oil markets are still firmly in place. Demand still seems fairly strong supporting the estimates that the demand for oil will increase by circa 1.5 million b/d for 2018 and at least through 2019. Russia, Saudi Arabia, and the Gulf Arab states are increasing production again as the production freeze seems to be of less interest now that oil is selling in the $70’s again. Most OPEC members have peaked out and can do little to increase oil production in the immediate future, if ever. Production from the US’s Permian Basin, which has been increasing rapidly in recent years, seems to be topping out due to the lack of pipeline capacity to move the oil from new wells to market. The pipelines should be close to full by the end of summer, and it will be another 18 months before new pipelines are ready to move oil out of the Permian Basin. Any significant increases in world oil production in the next year or so will have to come from Russia and the Gulf Arabs, although production from Iraq is moving up steadily. The most important downside to global production in the immediate future is Iran, which will come under sanctions from Washington, and those states with problems of political instability – Venezuela, Nigeria, and Libya. Flare-ups in any or all of these counties could cut global oil exports by 1 or 2 million b/d in the next year or so. If the IEA is to be believed, then three or four years from now the lack of sufficient investment in finding and developing more oil production will lead to shortages. This is about the timeframe when independent observers say US shale oil production will be peaking and begin a rapid plunge. The big unknown, however, is the course of the trade wars that Washington has launched with China, North America, and Europe. The dispute with China is particularly troublesome as many believe that it could result in a measurable drop in global GDP and demand for oil if the dispute continues indefinitely. The IEA’s Warning: The International Energy Agency warned on Thursday that spare oil production capacity risks being “stretched to the limit” as supply disruptions and US sanctions against Iran tighten the market. “Rising production from Middle East Gulf countries and Russia comes at the expense of the world’s spare capacity cushion, which might be stretched to the limit.” The agency sees no sign of higher production from elsewhere that might ease market tightness. Indeed, the problems in Venezuela, Nigeria, and Libya could easily take additional oil off the market. The IEA says there are only 2.1 million b/d of quickly available spare capacity in three OPEC members: Saudi Arabia, Kuwait, and the United Arab Emirates. If the Saudis increase output towards record levels of near 11m b/d this summer, as it has indicated, it would cut the kingdom’s spare capacity to “unprecedented” levels. In the past low spare global oil production capacity has led to spikes in oil prices as was last seen in 2008 when prices touched $140 a barrel. There are so many forces in play today that it is nearly impossible to predict whether or not we will see a large price spike in the next two years. US Shale Oil Production: In last week’s Petroleum Status Report, the EIA estimated that US oil production remained steady the week before last at 10.9 million b/d after having grown by 1.5 million b/d during the last 52 weeks. As these weekly production figures are estimates rather than actual reported production, it is difficult to say whether or not problems moving oil out of the Permian Basin have brought the rapid growth in US oil production to at least a temporary halt. Increasing crude oil and natural gas production in the Permian Basin and not enough pipeline capacity to move the products to market has widened the discounts at which oil and natural gas produced in the basin are trading relative to the US benchmarks. Pipeline companies continue to announce plans for more oil and natural gas pipeline projects in the area to ship oil and gas from the Permian to the Gulf Coast. However, many of those pipelines will not come on stream before late in 2019 and 2020. Analysts believe that the WTI vs. Midland, Texas price discount and the Waha natural gas discount to Henry Hub prices will become worse before they become better, at some point in 2020. Analysts at Morgan Stanley are saying that crude oil production growth in the Permian could shrink by nearly two-thirds next year because of limited pipeline capacity that will increase the already wide price differentials in the region. At the same time, the EIA is saying that US oil production will average 11.8 million b/d next year, up from the current 10.9 million. If these analysts are right, pipeline constraints will cap 2019 output growth in the Permian at 360,000 b/d, well below Wall Street expectations of about 634,000 b/d, and down from this year’s projected 960,000 b/d growth. The inability to move oil to market will push 12-month forward Midland-to-WTI differentials to a discount of $25 to $30 a barrel, from the prompt month $15.50 a barrel discount now. A side effect of the Permian shale oil boom is the voracious demand for fracking sand to prop open the cracks in the shale made by high-pressure water. In the last twelve months, 11 firms that dig and supply fracking sand have opened within sight of each other in West Texas, and another 10 or so are hustling to get started. Together, these new firms will mine and ship some 22 million tons of sand this year to shale drillers all around them in the Permian Basin. This amount of sand is equal to almost a quarter of the total US supply. Within a couple of years, industry experts say, the figure could climb to over 50 million tons, provided the boom continues and there is as much oil that can be economically extracted from the Permian as the industry and EIA predicts. Iran: Washington government continues its attempts to shut down Iran’s oil exports, and there are indications that it may be having some success. In recent week, the general consensus of how much Iranian exports will be hurt by the US sanctions has been changing from a loss of around 500,000 b/d by the end of the year, to something more like 1 million b/d, or even as high as 2.0 million in a worst-case scenario in which all countries comply. There are several reasons why the Trump administration may not succeed in cutting Iran’s exports by a significant amount, say 1 million b/d or more. These mostly center on the EU, Russia, and China seeking to shield Iran from the US sanctions, but only the Chinese government has the ability to decree purchases from Iran should exports slow elsewhere. During the past week, there were indications that South Korea, Japan, India, and some European refiners and associated companies are already cutting back on dealings with Tehran. French-based CMA CGM, one of the world’s largest cargo shippers, announced it would be pulling out of Iran for fear of being entangled in US sanctions. CMA CGM operates the third largest container shipping fleet in the world, with 445 ships, capturing 11 percent of global container ship capacity. The French company’s move comes as international firms have left Iran amid pressure from Washington. It seems that harshly enforced sanctions may have more impact than many initially believed. The sanctions are having repercussions in Iran where hopes for a brighter economic future have been curtailed. President Rouhani based his presidency on the nuclear treaty and more investment from the West so his political survival is now in question. Rouhani is sounding a lot like Iran’s hard-liners. During a visit to Switzerland he threatened to disrupt the flow of Middle Eastern oil through the Persian Gulf. Iran, which has few places to turn these days, has been touting $50 billion worth of potential Russian investments in its oil and gas sector as it seeks to deepen its relationship with Moscow amid mounting US pressure. Ayatollah Ali Khamenei’s top diplomat used a media interview during his visit to say that a Russian oil company had already signed a $4 billion deal with Iran that “will be implemented soon.” He added that: “Two other major Russian oil companies, Rosneft and Gazprom, have started talks with Iran’s oil ministry to sign contracts worth up to $10bn.” Moscow is hard pressed for cash these days, and it seems unlikely that it would be investing large amounts of money in Iran unless the terms were very favorable. Iraq: In Basra, security forces fired on protestors frustrated by a lack of jobs and services, as well as the salty water that shut down the Basra refinery. One demonstrator was confirmed dead, and at least two others and five members of security forces were injured outside the West Qurna 1 oil field last week. The lack of steady work, electricity, and potable water have been compounded by 120 degrees Fahrenheit heat and the reduced quantity and quality of water flowing from the Euphrates and Tigris rivers and tributaries. Increased salinization in the Shatt al-Arab – the confluence of the Tigris and Euphrates Rivers – shut down the country’s largest operational refinery. Five days of protest came to an end on Thursday after the government promised jobs, electricity and clean water. Oil production stayed normal, and ExxonMobil, Lukoil, and BP remained in control of the respective fields, according to Oil Ministry and Basra Oil Company officials. In the north, production has fully resumed at the Bai Hassan field outside Kirkuk. The field is part of a complex of oilfields in Northern Iraq that were shut down mid-October 2017 after the Kurdistan Regional Government unilaterally voted for independence from Baghdad, causing Iraqi troops to move in on the oil facilities in the Kirkuk area under Kurdish control. Saudi Arabia: Oil and gas analysts at BMI Research say “The Kingdom has reaffirmed that it holds 2 million b/d of spare capacity”, which implies a total production capacity of around 12 million b/d. 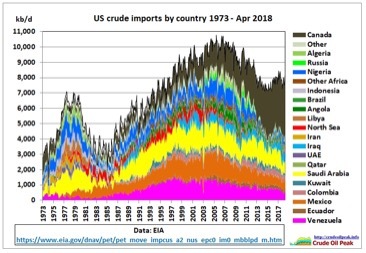 “However, bringing all its spare capacity into play would incur a significant cost, while production would take time to bring fully online.” “Increasing crude output from 11 million to 12 million b/d would likely take on the order of six to 12 months.” BMI added that it was unclear that there will be a market for the additional barrels, and how sustainable that market would be. In early 2016, Crown Prince Mohammed bin Salman said he planned to sell shares in Saudi Aramco, the company that produces 10 percent of the world’s oil and finances the Saudi state. The initial public offering—planned for 2018—would raise more than $100 billion for a new sovereign wealth fund, creating the world’s most valuable listed company, and funneling hundreds of millions of dollars in fees to Wall Street’s elite banks. The company would be worth at least $2 trillion and perhaps as much as $2.5 trillion. However, Saudi Arabia’s willingness and preparedness for a stock market listing of Saudi Aramco is now in doubt amid concerns about legal exposure and an inability to generate the $2tn valuation sought by crown prince bin Salman. “It is a sovereign decision.” Amin Nasser, chief executive of Saudi Aramco, said that Riyadh had yet to determine whether an IPO would take place. International energy majors are prioritizing cutting costs and returning money to investors through dividends and share buybacks after the industry downturn. “It is an indication that companies are worried about meeting shareholder requirements,” said Mr. Nasser of a reluctance to invest in projects that are costly and take more time to develop but tend to last longer. Libya: On Wednesday Libya lifted its force majeure on the Ras-Lanuf, Es Sider, Marsa, El Hariga, and Zueitina oil terminals, according to a statement by National Oil Corporation Chairman Mustafa Sanalla. Libya’s oil production slowed significantly at the beginning of July after the Tripoli-based NOC declared force majeure on crude oil loadings at the Hariga and Zuetina oil terminals, adding to the force majeure at the Ras Lanuf and Es Sider terminals. The NOC said on July 2 that the total daily production loss amounted to 850,000 b/d of crude oil. The NOC also lifted the force majeure at the El-Feel oil field, which had been in place since February 23, 2018, over a dispute over pay and benefits. Oil pumping at the field—operated by a joint venture of Italy’s Eni and NOC—is expected to resume to 50,000 b/d within two days, and to 72,000 b/d three days later. With these announcements, Libya’s oil production should be back over 1 million b/d. The trade war between Washington and Beijing remains the top issue affecting the world oil market. Last week China warned it would hit back after the Trump administration raised the stakes in their trade dispute, threatening 10 percent tariffs on $200 billion of Chinese goods. US officials on Tuesday issued a list of thousands of Chinese products to be hit with the new duties. The top items by value were furniture at $29 billions of imports in 2017, network routers worth $23 billion last year and computer components to the amount of $20 billion. The list is subject to a two-month public comment period. As the US does not sell China a sufficient quantity of goods to fully retaliate, Beijing is looking at ways to harass US firms doing business in China by withholding licenses and audits. 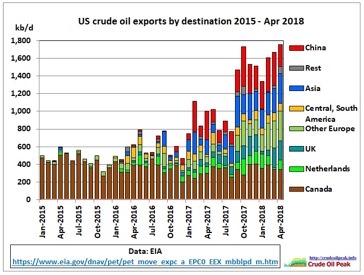 Beijing has already cut back on imports of US crude oil but is leaving LNG imports from the US alone because of its desperate need for more natural gas. China’s crude oil imports fell for the second month in a row in June to the lowest since December, as shrinking margins and volatile oil prices led some independent refiners to scale back purchases. Beijing has always been patient in waiting for lower crude prices before making purchases for its strategic reserves. How the Chinese economy will fare if exports to the US are substantially curbed due to the new US tariffs is another great unknown. In recent weeks Beijing seems to have relaxed its efforts to keep a lid on debt as it faces a softening economy and the trade tensions with the US. The State Council has started urging local governments speed up already approved investment projects to re-energize growth. An air monitoring report last week by the Chinese government showed particulate matter in the air of major urban areas declined by nearly 23 percent last year when compared with 2013. The report attributed the change in part to an 8.1 percent decline in the use of coal and the 6.3 percent increase in clean energy consumption over the last five years. The Chinese government recognizes that controlling air pollution is one of its tougher goals as it looks to continue industrialization and economic growth at the same time. Last week, legislators held a two-day extraordinary session to consider additional air pollution controls. The reduction in the use of coal has been largely confined to cities, and its use continues to grow elsewhere to provide the electric energy needed for economic growth. Moscow’s energy minister, Alexander Novak, was busy last week holding press conferences and prognosticating on the state of the oil markets. On Friday Novak said that Russia and other leading oil producers might boost oil output further if supply shortages hit the global oil market. He also said Russia might surpass the 200,000 b/d production increase that is currently underway if there is a need for it. Novak said higher crude prices this year would add $40.14 billion to Russian state revenues this year. Novak is also concerned that higher oil prices brought on by the US sanctions on Iran and various production shortfalls around the world will be negative for the global economy. Russia’s Finance Ministry also warned last week that if prices remain at their current level, another collapse could be coming soon. For the foreseeable future, Nigeria is likely to remain a concern to the global oil markets because of the volatility of its roughly 2 million b/d of oil production. The country’s population is projected to grow from more than 190 million today (50 million greater than that of Russia) to 392 million in 2050. The country is composed of more than 250 ethnic groups and has developed a tradition of government corruption since gaining independence in 1960. Very little of the revenue from 2 million b/d of oil sales makes its way down to Nigeria’s villages, and every year billions in oil revenue paid by foreign oil purchasers disappear so that not even the world’s best auditors can track it. Nearly every day attacks by thieves, vandals, and dissidents take place along some portion of thousands of miles of pipelines carrying crude, natural gas, and finished oil products. Last week the Nigerian National Petroleum Corporation issued a rare report outlining the cost to the country of the “vandalism” to the pipelines and the lack of money to perform necessary maintenance on oil facilities. The company says that last February Nigeria’s oil sector lost over 754,000 b/d due to production shut-in occasioned by pipeline vandalism. Not all of this loss is due to thieves drilling holes in pipelines to steal oil or militants blowing them up to pressure the federal government for a larger share of the revenue, but simply from lack of timely maintenance on facilities. According to the report, about 160,000 b/d were shut-in throughout February due to the aging facilities/integrity issues at the Qua Iboe Terminal. This situation of constant oil theft, insurgent sabotage, and lack of maintenance is unlikely to end soon. In recent years, the major international oil companies have been quietly selling off their interests in onshore Nigerian oil production in favor of offshore production which is relatively secure from thieves and dissidents. A separate official said that production continued to fall in the first 11 days of July as more rigs were scrapped and more wells were shut down. PDVSA is “dying operationally,” the official said. While OPEC’s secondary sources estimated average output at 1.34 million b/d in June, the Venezuelan government reported production figures at 1.531 million, the same as May levels. More than $9 billion in bond payments fall due this year; inflation is set to top some 13,000 percent this year, and GDP could shrink by a further 15 percent. By the end of the year, GDP will have contracted by nearly 50 percent since 2013. Venezuela has been losing around 50,000 b/d of its oil production each month so far this year, which means it could lose another 300,000 b/d before the end of 2018. The losses are tightening the oil market; others will have to increase production to make up for the declines.